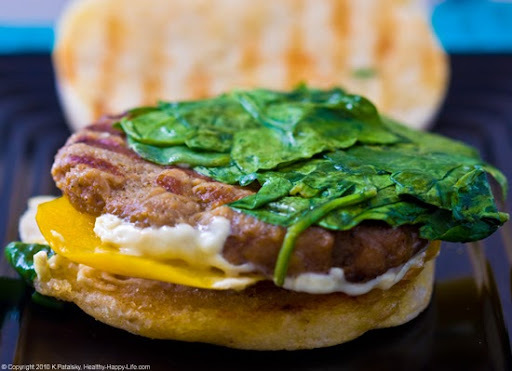 Breakfast Sandwich! 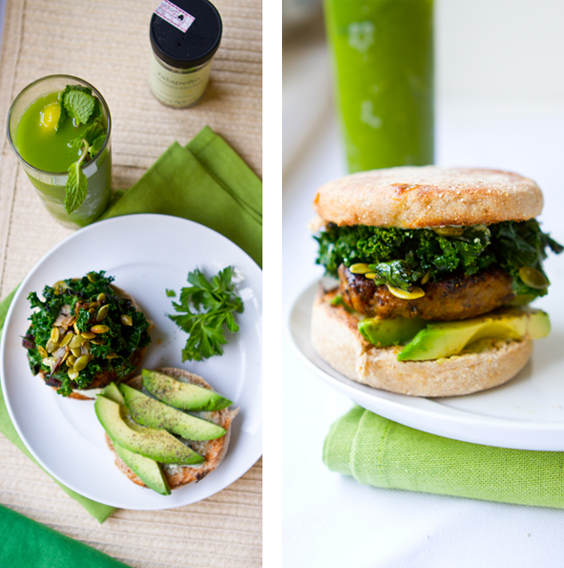 Vegan Recipe - In 15 Minutes! Looks mainstream, but it's vegan!.. Panini Pressed. I used my panini press to whip this baby up - but you can use a traditional stove-top skillet and spatula - or a stove top grill press. Buy my fave grilling tools here. 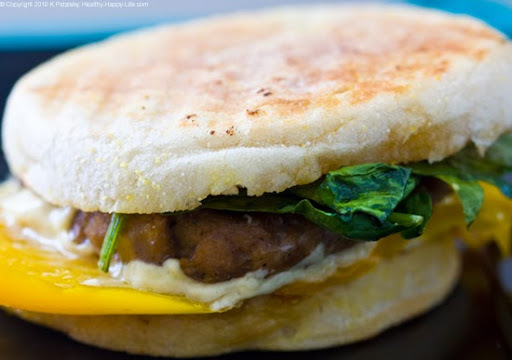 So many vegan breakfast sandwiches to try!.. Vegan Sausage. I used Lightlife Gimme Lean SausageStyle ground soy. It comes in the thick tube. 60 calories per 2 oz - plus it is fat free! 7 g protein per serving as well. Soy based. vegan. ps, there are a few non-vegan soy sausage-patties out there. They contain egg and sometimes dairy - read those labels! 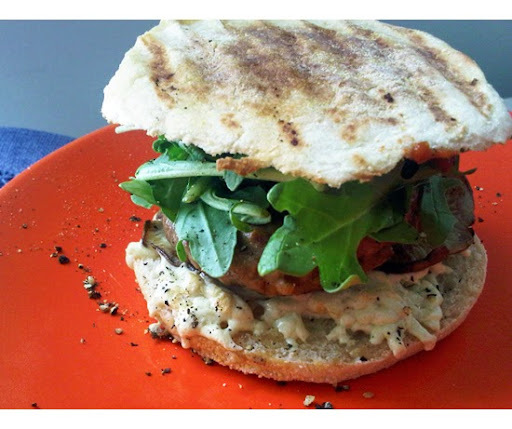 This super easy vegan breakfast sandwich can be whipped up in just 15 minutes! Super flavorful! Grab all you ingredients out of the fridge. 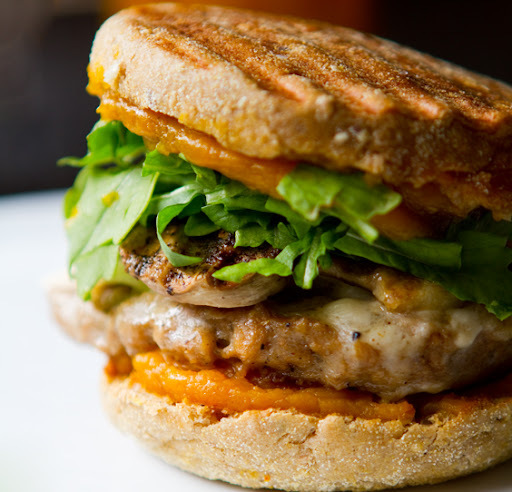 Stick your English muffin - uncut under the grill press for 45 seconds while you arrange your ingredients. 2. 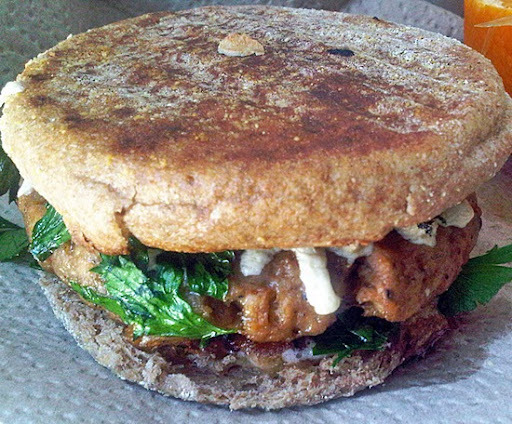 Slice off 2 Tbsp of the vegan sausage (you know the kind that comes in the thick tube) and hand-press a nice patty. 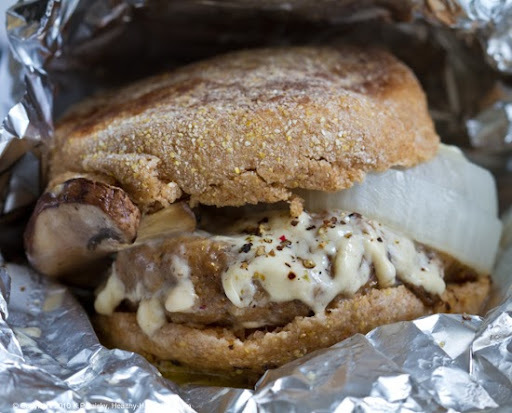 If you are feeling really adventurous, you can even press some diced onion into the patty as well. Rub the paty in a very light amount of EVOO and place it on the heated grill. 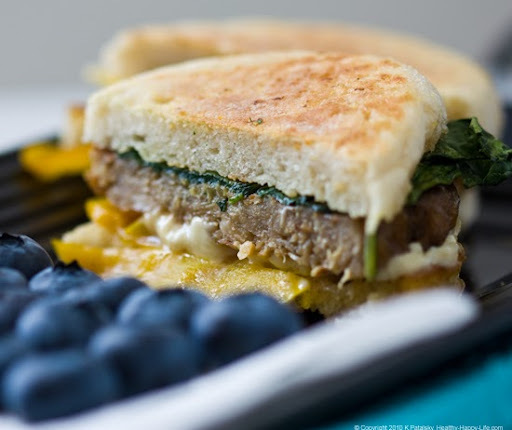 Remove your English muffins and press the panini grill shut - or cover your stove top skillet with a heavy spatula or foil. You want it to cool through in just under 2 minutes. Thinner patties cook in a flash. 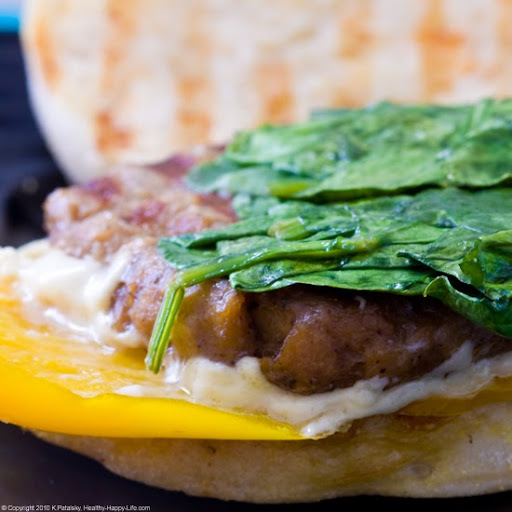 Slice open your English Muffin and place the open faced ends back on the grill while you prep your veggies. Rub some sliced pepper in a bit of EVOO and place it on the grill as well. 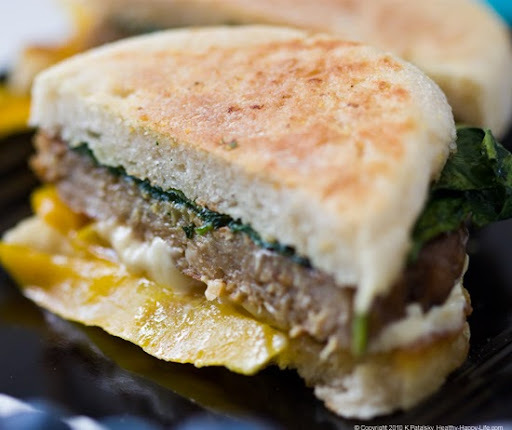 Close panini lid and allow the vegan sausage, peppers and bread to grill for another minute. After a minute, lift lid and observe doneness. Pull anything that looks very done. Otherwise turn off panini press and close to keep heated. Grab your cheese and sprinkle it right over top the patties - still on grill. Then place the sizzling hot peppers right on top of the cheese so that it creates a hot barrier - and close the panini press one more time. Yes, the panini press/grill is on off - but there will be enough heat from the grill and peppers to melt the cheese. Grab your English Muffin and spread 1 tsp buttery spread on one side - the maple syrup and/or jam on the other. 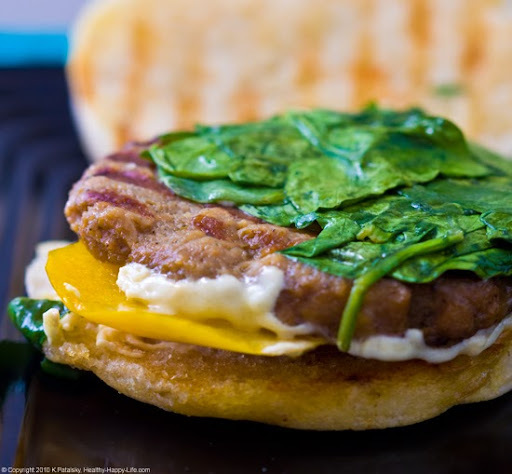 Start building your sandwich: Muffin, patty (with cheese and peppers), layer your fresh spinach on top of that (and optional harissa) then close with top half of muffin. Slice. Serve! Tip: You can even wrap your sandwich up and take it on the road with you - maybe eat it on the subway and make everyone else jealous. OK, that's not nice. Eat it at home with a side of fresh fruit or juice. You'll feel sooo much better with a full belly on a busy day!